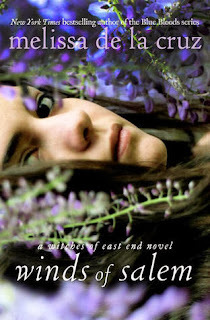 Melissa de la Cruz continues her Witches of East End series with her latest novel, Winds of Salem. I struggled to give this book an honest 3 stars. The premise behind the Witches of East End is very good. The story centers around a mother and 2 daughter witches living in present day North Hampton. Based on events that predate the series, they have been forbidden from using their magic, and it is starting to tear them apart. The first book was fairly entertaining and kept me engaged, but the series went downhill from there. However, I really wanted to know where the story would go, so I kept going. Winds of Salem goes back and forth between Freya, who is stuck in 1692 Salem and the rest of Freya's family in the present day who are trying to figure out how to get her back. It is kind of confusing in the beginning, because you can't really figure out what's going on with Freya, plus the fact that she appears to be about 14, not her actually 19-20ish. You eventually begin to understand that she is reliving the Salem witch trials, which she and Ingrid already suffered through. Meanwhile, Joanna and Norm (Freya and Ingrid's mom and dad) are trying to find a way to get Freya back, because for some reason, the fabric of time is all messed up and they can't get back through. Freya's twin, Freddie, is having problems of his own (which is pretty much a pointless side story as it adds nothing to the plot) and Ingrid is, once again, facing doubts about her relationship with the mortal Detective Matt Noble. All in all, the story was dull and confusing to follow. I don't think Melissa de la Cruz is a very good writer and the story really suffered. I wouldn't recommend the series, because if you read the first book, you're going to want to read the others and you'll be disappointed.